"t's easy to speechify about morality. But actually writing legislation that makes sense--and complies with the demands of the U.S. Constitution, which does not seem to give Congress the authority to legislation in this area--is far more difficult." "The U.S. Congress may soon vote on a new "compromise" spy law that would still likely derail pending suits against AT&T and other companies accused of opening their networks to the government in violation of wiretap law." "Larry Dignan: Chinese hackers may have been behind power blackouts in Florida and the Northeast, according to a report in the National Journal." "China and the U.S. lead the world as the two biggest sources of Internet attack traffic, according to a report published by the content distribution company Akamai." "The glass is certainly not full, but it’s certainly a lot more full than it was 5, 10, or 20 years ago… and much more full than the Western media gives it credit for." "growing mountain of evidence demonstrating that corporate executives forced their news reporters to propagandize in favor of the Bush administration and the war, and censored stories that were critical of the Government." "The destruction that ravaged Sichuan province during the May 12 earthquake could leave an unexpected legacy in Chinese society: a new public expectation of openness and accountability." "We believe the basic concepts embodied in the Report are sound and should be supported by the business community in the United States for the reasons elaborated in this memorandum." "Peking University professor Zhang Qianfan (张千帆) argued that the building of local “democratic mechanisms” was necessary if China wished to avoid repetition of the tragedies of Wenchuan." "The bill has been criticized by the Electronic Frontier Foundation and others for putting tech companies in the middle of a tug-of-war between governments. Critics also say it's a simplistic approach to the complex problem of government censorship." "however imperfect, the landmarks of openness witnessed so far in the handling of this tragedy could go far in convincing Party leaders that the benefits of openness far outweigh the costs..."
"[Clay] Shirky’s ideas on the extraordinary power and occasional madness of online crowds would be an apt explanation for both the apparent effectiveness and mob mentality of the Human Flesh Search Engine..."
"A massive government database holding details of every phone call, e-mail and time spent on the internet by the public is being planned as part of the fight against crime and terrorism. " "Does rapid, open response to the quake disaster mark the birth of a more responsible, transparent China?" Very interesting. Comments also worth reading. "Beijing embarks on a $10-billion rebuilding effort as it curbs media reports amid growing survivor discontent." "More and more voices from around the globe are finding a place on the Internet -- even in countries where Web filters and censorship are the norm." "Has the Chinese government, as many foreign media are saying this week, truly demonstrated maturity in its handling of the earthquake disaster, through tolerating discussion and even criticism of its response? It depends who you ask." On the eve of a Senate hearing, a Cisco internal presentation from 2002 is leaked. 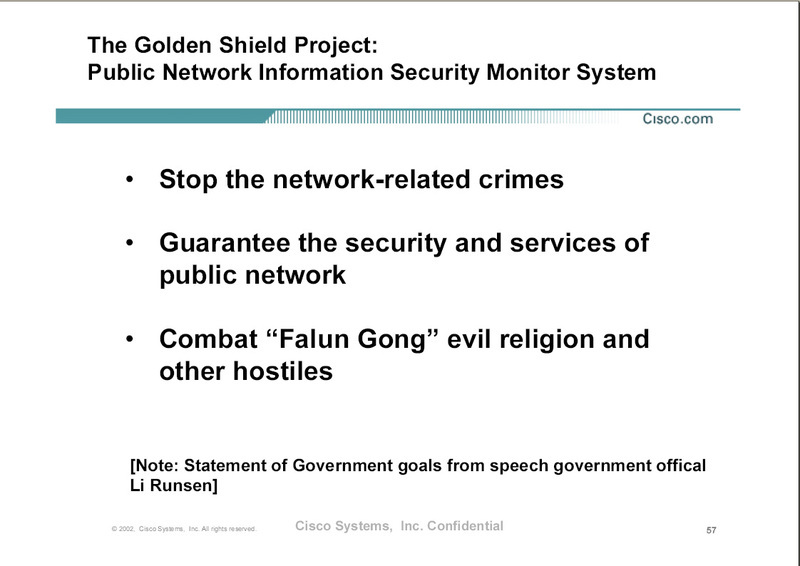 It outlines business opportunities presented by China's Golden Shield project for surveillance, censorship, and police communication. "this report presents a conceptual and policy framework to anchor the business and human rights debate, and to help guide all relevant actors." Isaac's final sentence: "There will be new opportunities in the next few years for Chinese people to adopt free thinking and universal values by harnessing the power of vast social media tools."